TORONTO - One of the biggest trials in Canadian corporate history got under way Monday, with the Crown prosecutor beginning to lay out his case against three former Nortel Networks executives accused of falsifying financial reports. Each of three accused men sat in separate rows of the court room with his lawyer. Former chief executive Frank Dunn, clad in a pinstripe suit, sat calmly in the front row throughout the afternoon hearing. Dunn, former chief financial officer Douglas Beatty and former corporate controller Michael Gollogly each stood separately to enter clearly stated not guilty pleas to two charges before the prosecutor began his opening statements. Crown attorney Robert Hubbard alleged the three men worked together to falsify Nortel's records and statements — to make it look more profitable than it was. Hubbard said Nortel's financial statements were incorrect by "over half a billion Canadian dollars" in the first and second quarters of 2003 due to the alleged fraud. The veteran criminal prosecutor argued it is clear that the way Nortel recorded its financial statements during that time was not in accordance with generally accepted accounting principles, though the executives signed off that they were. "The only real question is, did you know it at the time?" Hubbard said, gesturing to the accused across the courtroom. Hubbard said he aims to prove that the three men falsified the statements because bonuses for senior executives were linked to consecutive quarters of profitability. In order to trigger those bonuses, the accused "had to juggle accounting to achieve those results," Hubbard said. Even though Nortel had been losing millions of dollars for several years, it was still generating huge revenues from global sales of advanced technology and continued to reward employees with stock options linked to performance. At the time, Nortel was still Canada's largest high-tech company — although it was no longer the stock-market star it had been a few years earlier. 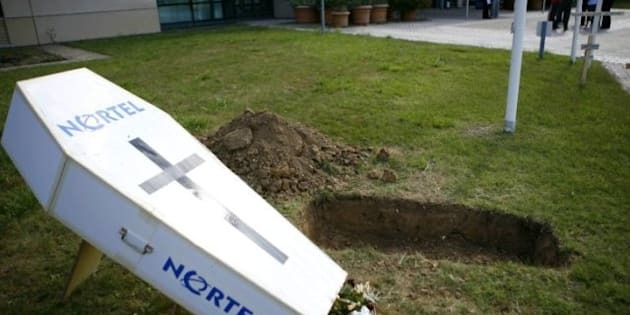 Nortel has since gone out of business and its assets sold off in pieces to various buyers — even though it was at one time Canada's most valuable company, with more than 90,000 employees worldwide. Dunn, Beatty and Gollogly were dismissed from the company in 2004 — five years before Nortel was forced to seek court protection from its creditors. Many observers have suggested that Nortel's accounting scandal distracted its senior executives and prevented it from competing effectively against its rivals. The defendants have also been investigated by the U.S. Security Exchange Commission and the Ontario Securities Commission. Dunn filed a defamation lawsuit against the company in 2006 as a result of the allegations of dishonesty. The trial — before a judge only and without a jury — got under way in Toronto on Monday after Justice Frank Marrocco ruled not to delay over a pre-trial defence motion requesting more details about the accusations. Hubbard said the Crown will bring 27 witness, including key former executives who may have been accomplices. He will resume his opening arguments Tuesday morning after a late start on Monday afternoon. The Ontario Superior Court trial is expected to last more than six months. After court was adjourned Monday, Dunn strode stoically past reporters, not uttering a word. Beatty walked more briskly, but answered a reporter's request for comment, with a brief "not today." It is being presided over by Marrocco, who was the lead prosecutor in the case of Bre-X Securities, the biggest corporate fraud in Canadian history. Standing outside the courthouse, former investor Rob Moore said he wanted to attend the trial of executives at the company whose collapse saw him and his father lose more than $10,000. "I just hope that there's going to be proper justice ... and that there's going to be substantial penalties and not just a slap on the wrist or probation or a fine that I'm sure these guys can afford. "I think a jail term is certainly appropriate and a significant jail term — it would send the right message." The Nortel accounting scandal of 2002-2003 produced one of the most spectacular stock market flameouts of a Canadian company, dragging down the share price of what had been Canada's premier technology firm from a peak of $124.50 in 2000 to penny-stock status. Nortel's stock has since been delisted and is worthless. The company filed for bankruptcy protection in 2009 in the United States, Canada and Europe amid mounting losses, falling sales, big debts and a legacy of legal issues. Thousands of Canadians lost their jobs when Nortel folded, though thousands of positions were also rescued when other tech giants bought up Nortel's assets. The company has sold almost all its operating businesses to various buyers for more than $3 billion. At its peak during the 1999-2000 technology boom, Nortel went through several years of rapid expansion and diversification funded by debt and stock sales. It briefly became the world's largest supplier of telecom equipment. The Nortel case was one of a wave of accounting scandals that led to the collapse of high-profile companies such as energy trader Enron Corp., the WorldCom phone giant, cable operator Adelphia Communications and the Hollinger newspaper group. Various executives, notably Canadian-born Bernie Ebbers of WorldCom and Conrad Black of Hollinger, were sent to prison after U.S. convictions that held them responsible for wrongdoing at their companies.